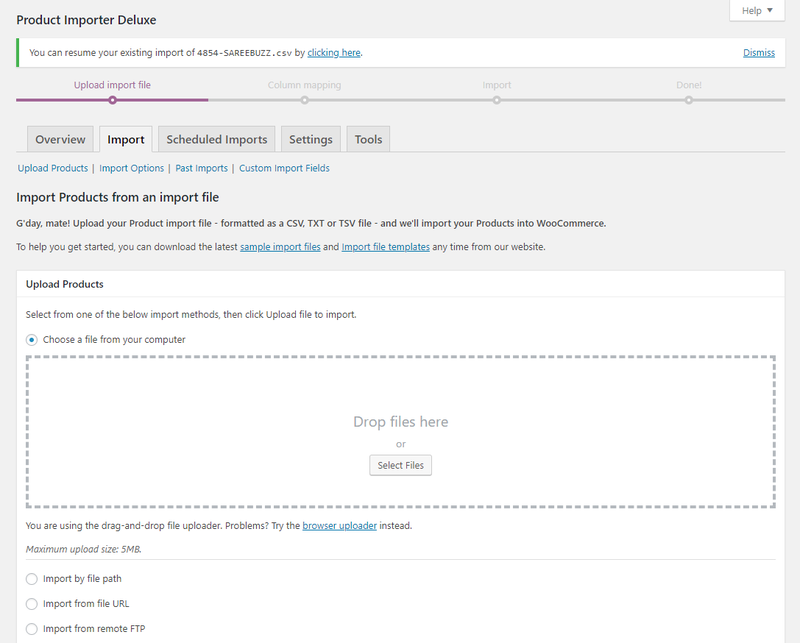 I haven’t updated the products on my website for some time, as I’ve had other priorities recently, but I’m just running the importer now, using the latest Version 3.1.8, & I have to say I’m very impressed with the recent updates – live installation messages, and, for the first time, I’ve been able to import them (2,599 products, all with external image URLs) in one large file, whereas I always used to have to split the file into three. Keep up the good work, Michael! Yes, I’m very pleased with the way it works now. I don’t use product variations, as I haven’t even looked into what format I would need the products to be in, although my site would probably benefit from it. Is it still part of the plan to combine the adding and merging processes into one import? 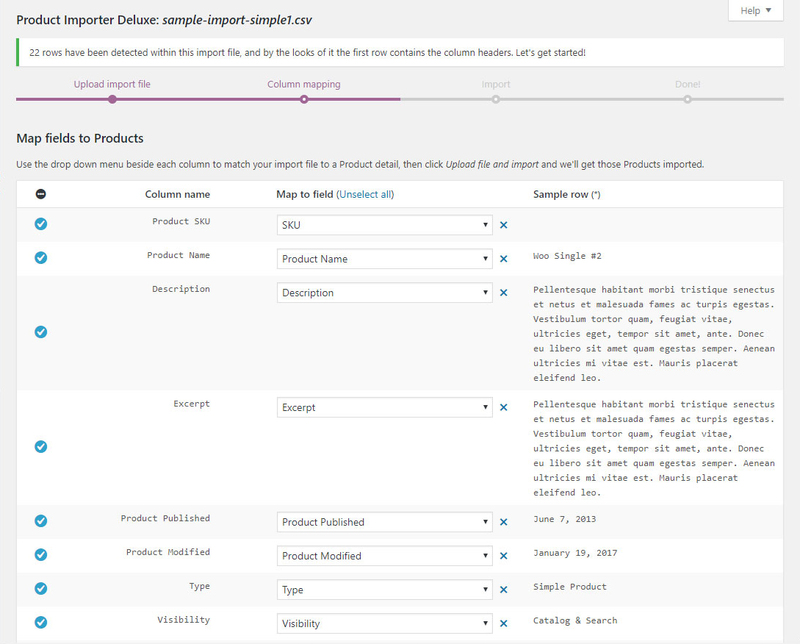 I guess at the moment, if our products list includes both new and updated products, then we should still run the import twice, once with and once without the merge setting – is that right? 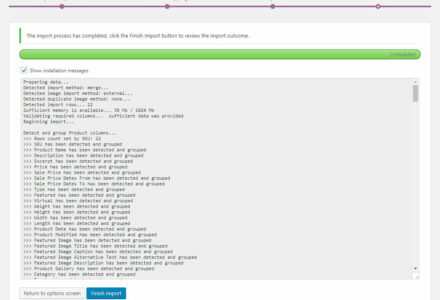 Hi Paul, yes it’s on the roadmap to combine import/merge, whether that’s as a import and skip duplicates or import and merge/override import method. For now running the importer twice is the way to go. Sorry to keep asking, but is this still planned for a future release? 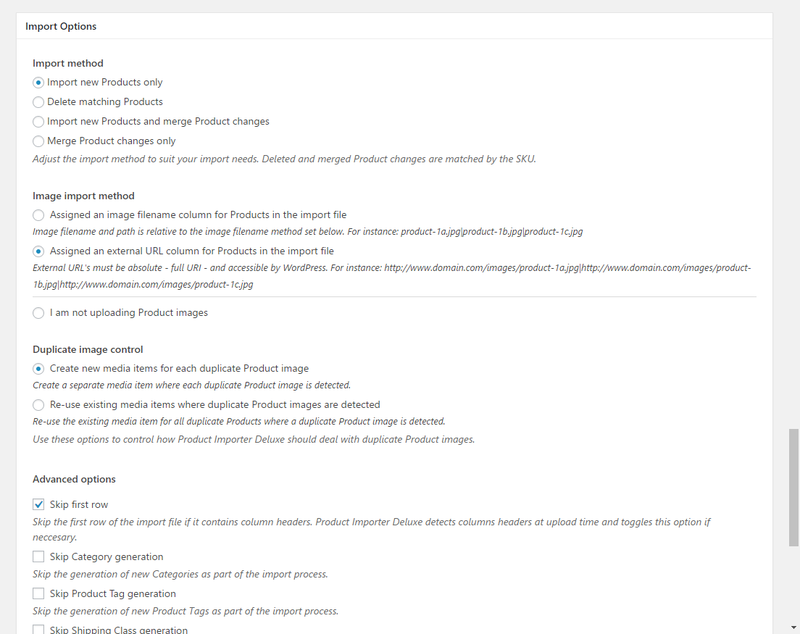 The reason I ask is that I’ve just imported a new file, with around 2,500 products that may have been updated, and three new products, and I first ran it with the Merge option ticked. Then I just went to run it again without the Merge option ticked, & I noticed that the new products have already been added to the site. I believed that new products would simply be ignored if the Merge option is ticked – could you clarify this for me? I’m having memory errors come up even though we have changed the allowed PHP memory. Won’t import more than one or products at a time. I have 528 products I want to upload currently but sometimes need to do more like 2000. 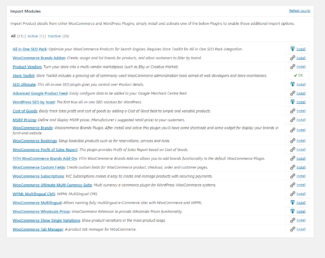 Running latest plugin with WP e commerce 3.8.8.5., WordPress 3.4.1 Also I’m wondering if there is a support for a field to disable posts on product pages? Hi David, can you please update to the official 3.1.8 Plugin update. 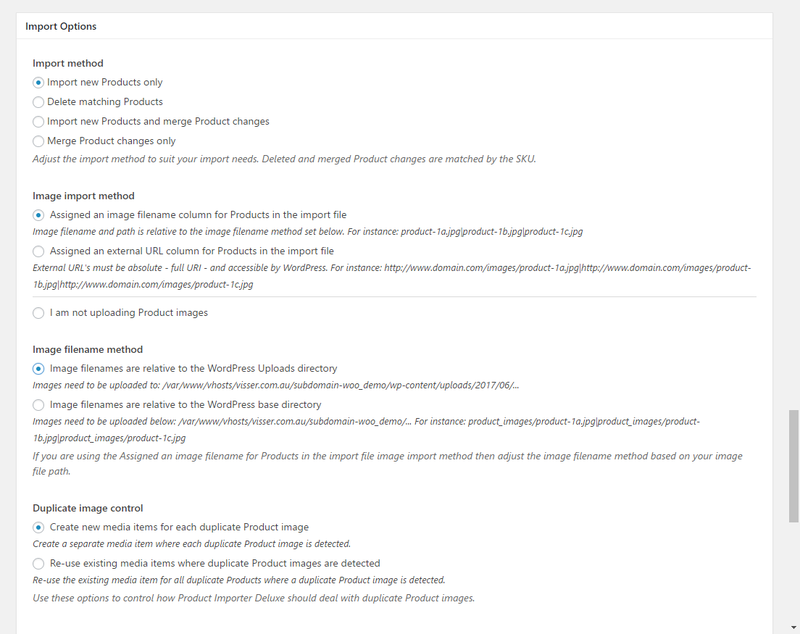 As I write this I’m watching an import run on one of our test stores with 600+ Products (and multiple images assigned to each Product), memory is capped at 64M, it also has 20 activated WP e-Commerce Plugins to keep it busy. From the WP Admin Dashboard it’s idling on 47M out of 64M giving less than 20M to the importer. 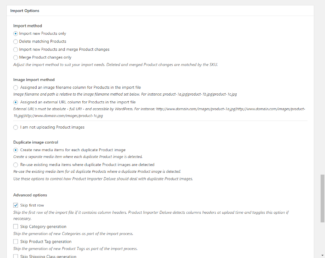 Once they’re done I’ll be running an import with ~4,600 Products on the same site before working on a CSV and image filename generator to pull in over 10,000 Products (with multiple images). No worries I’ll give it a go and let you know. Hi David, that error means WordPress has consumed the entire 128M available. 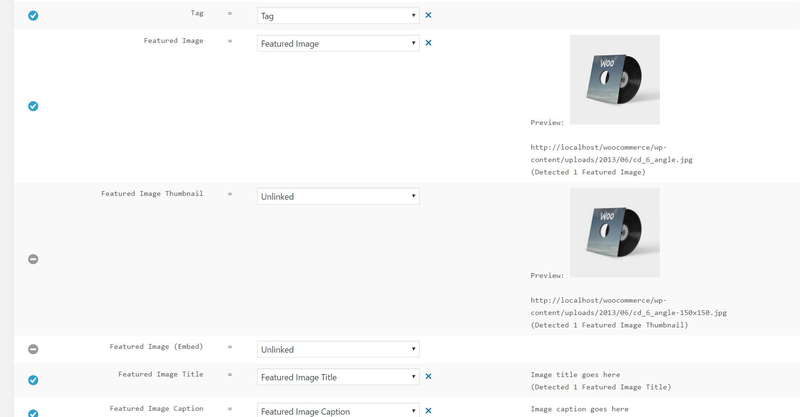 The WordPress file media.php is called by our Plugin to handle thumbnail resizing, previously we handled this ourselves but since WP e-Commerce 3.8 all image thumbnails are generated by WordPress. If you can get in contact I can better understand whether this is due to too large images or a missing image library in PHP that WordPress can use which is less memory intensive. Michael, once I dropped my product image file sizes below 400k everything went through ok. 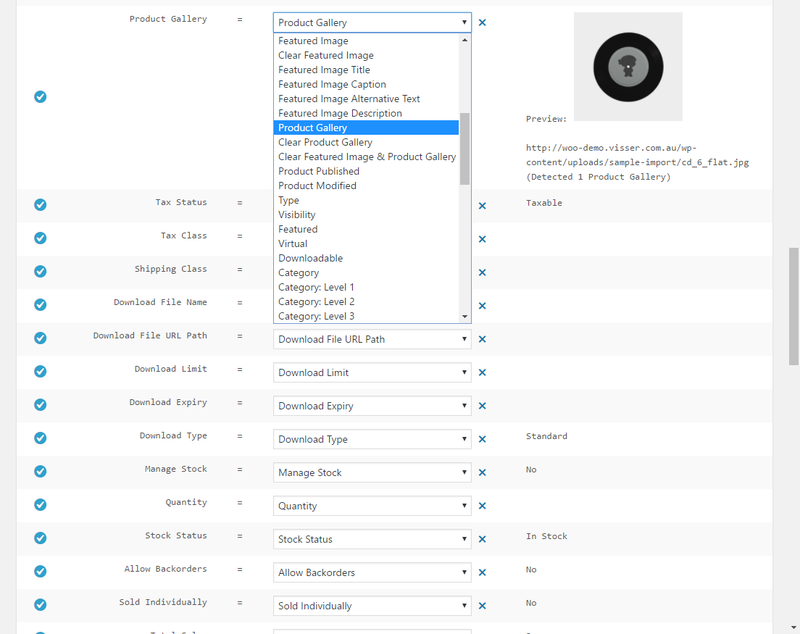 File size restrictions/recommendations for product images may be a good thing to ID in your documentation. Hi David, been looking further into memory overrides, if you add this to your wp-config.php it ‘should’ lift the memory limit across WordPress and all the nooks and crannies we’re using (this means our Plugin and WordPress image functions that we’re calling). 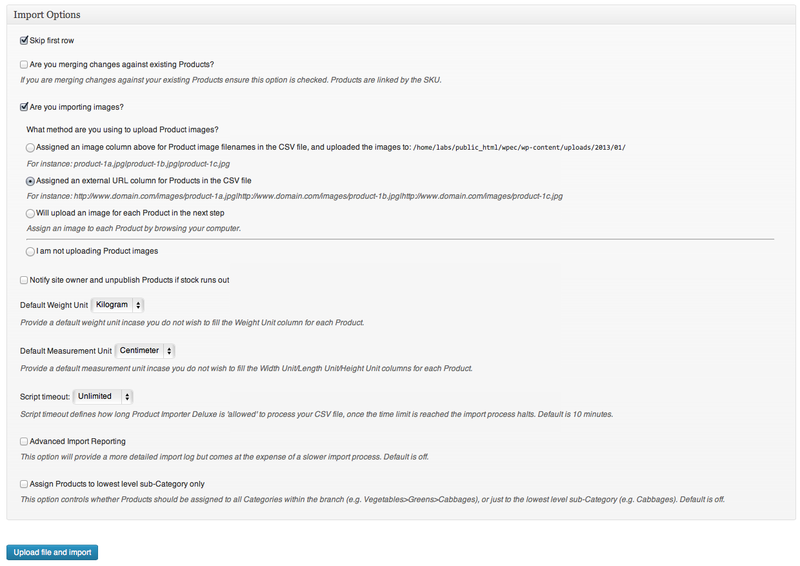 Hi David, you can use the Comments Product detail to control whether comments are allowed on Products. The accepted values are on/off, 1/0 or true/false. Michael, For what its worth, I was having the same “out of memory” issues and I tried everything (disabling plugins, altering config.php, .htaccess, and the plugin itself. The thing that ended up working was reverting to the previous version of PHP. Im not sure how this worked and it might not make much sense, but thats what worked for me. Hi 1fabricco, that is weird. How much allocated memory was available within your store? It could be that some versions of PHP are more memory efficient than others, I tend to the latest software on our test sites. Will look into this further for an explanation. Script timeout cannot be adjusted as the server hosting your WordPress site is running PHP in ‘Safe Mode’. Contact your hosting provider to adjust the maximum execution time. 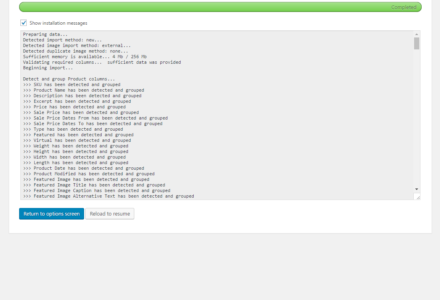 I’ve contacted my hosting provider and he says this site is not in safe mode. This is the first time I’ve seen this. I know my site has been moved to a new server recently. I can only import around 20 products at a time before the server times out. Do you have any helpful advise? 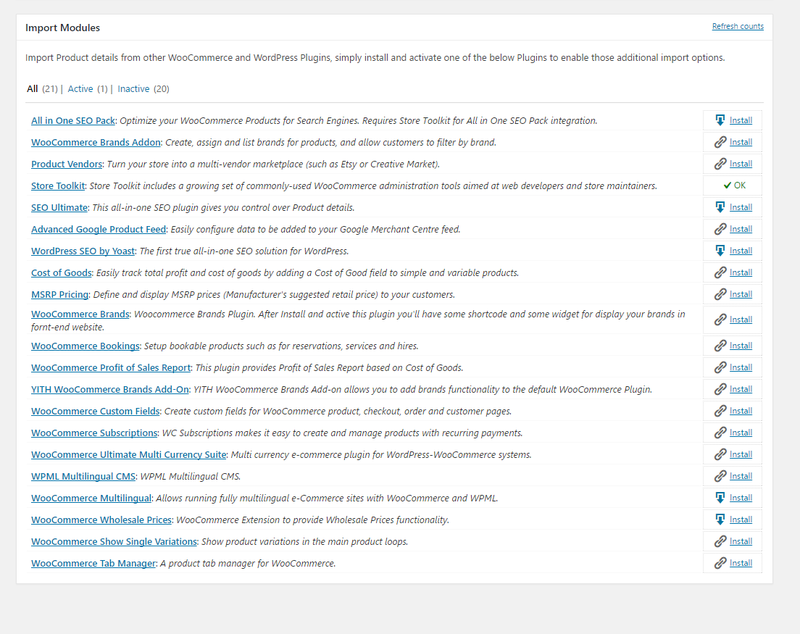 I have over 8k products to load asap. Hi Jamie, our Plugin returns that prompt when the internal PHP ini_get( ‘safe_mode’) return true, this means that the safe_mode (ala Safe Mode) option is enabled for that hosting instance. Due to this we cannot override timeouts or memory limits which is why the importer is timing out. 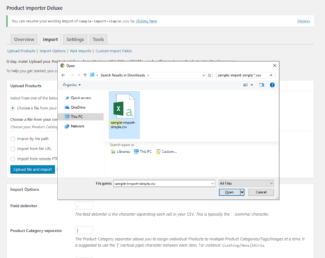 Our 3.1.8 Plugin update may get around this which will be let loose on Monday evening – just finalising testing of this major release – for updating within customer stores. I am getting the error message “The file you uploaded exceeded the maximum allowed filesize.” The file is .csv and only has 20 rows and has a size of 8k. 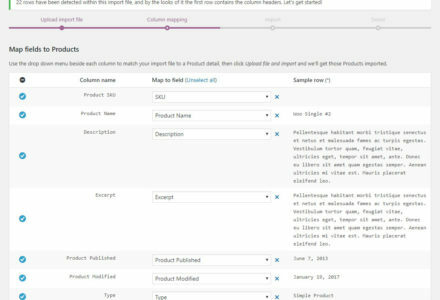 Is there any way to bulk delete products? 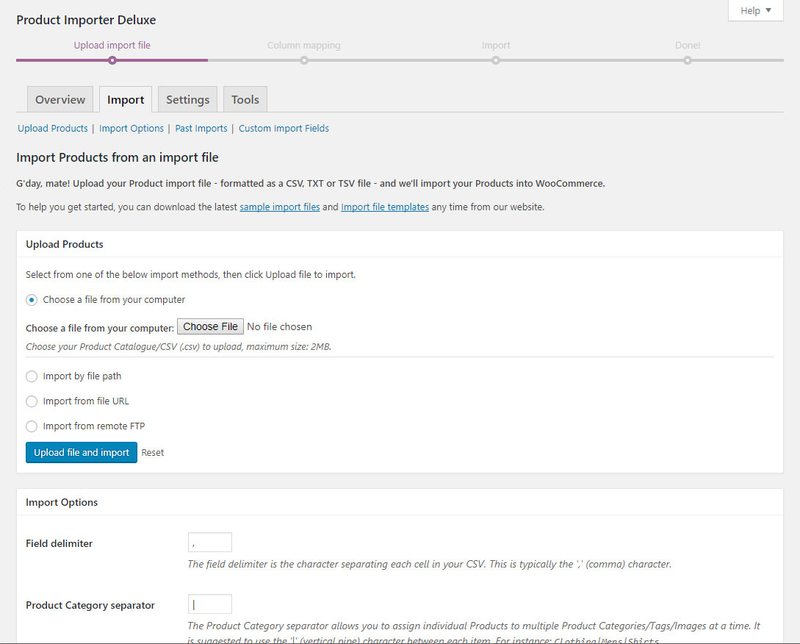 Having to delete 20 at a time when there are ovr 2,000 products is not feasible. If there is not an automated way, can I go into the database or another file via FTP and remove them? Hi jdhart123, please see our free Store Toolkit Plugin for bulk removal of Products, etc. Guys are these timeout issues caused by the plugin or the database itself. Perhaps the database needs tweeking. Im no expert but thats where i would go looking first! Isnt there some restrictions on the free versions of mysql and sql?if u have 20,000 records im wondering if u exceed the restrictions for that version of each? I had the same error and assumed that none of the products got imported. However, they were listed under Products. Have you checked this? I eventually broke my list into increments of 1,000 but that’s not always feasible. 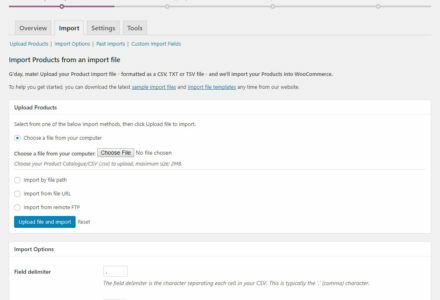 Hi jdhart123, we’re introducing a new import engine which imports each Product as its own PHP process so we can display live progress of the import as well as the import log. The current importer loads a single PHP process and then just keeps turning until it either completes or times out/runs out of memory. The product page keep telling the customer that the product is out of stock. When I look at the product settings page in the backend under the tab Stock, nothing is there. The checkbox for “Handle the stock for me” is unchecked and the stock quantity is 0. I am having the same issue. 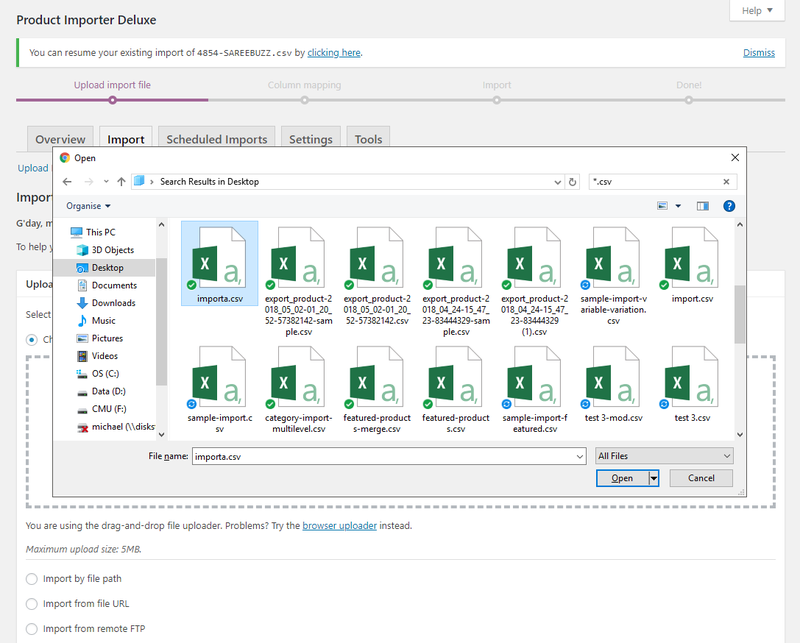 Initial import works great, but updating quantity on an existing item does not update. This would be a HUGE time saver, if it worked properly. Anybody find a solution for this? 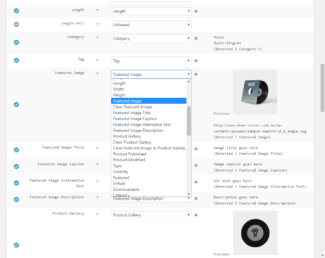 If you have all your products downloaded into a cvs file from Ecwid…how does your uploader upload the correct image to the correct product? 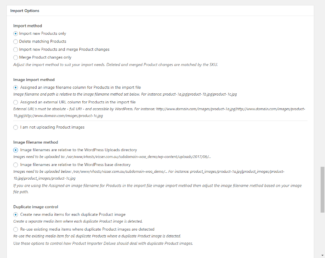 How does this plugin handle product updates? For example, I load up 100 products. 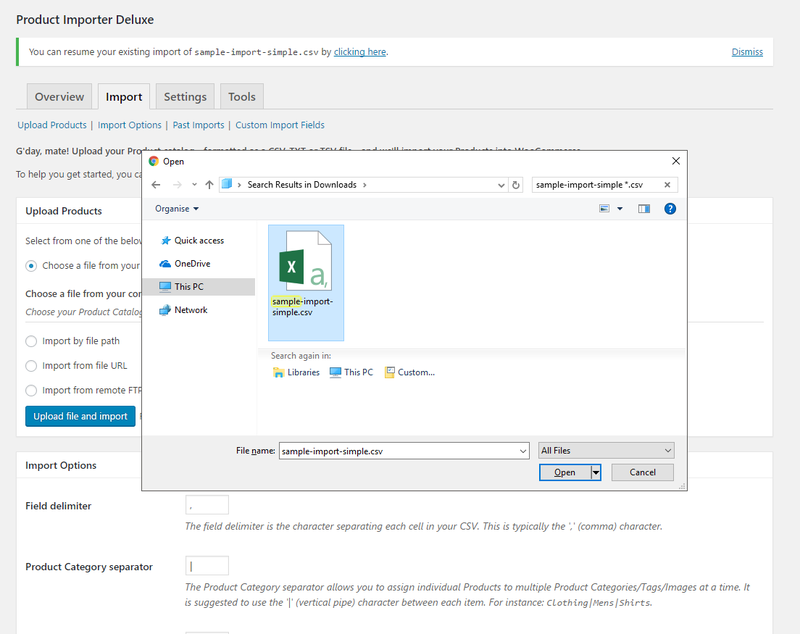 A week later, I make changes to my CSV file and I want to reload my products. 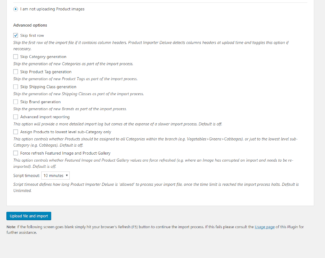 Will this plugin duplicate my entries or will it match the product name and just update each entry? I’ve tried other plugins and unfortunately they duplicate my entries. I’m willing to buy this plugin if it can handle updates properly. Hi HW, there is an import and merge option at import time. 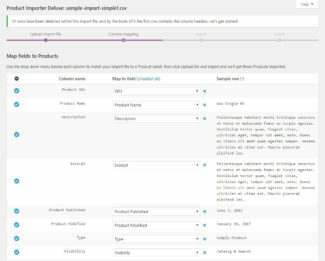 This will either import new Products and skip duplicate SKU’s or alternatively update Product details based on the SKU. 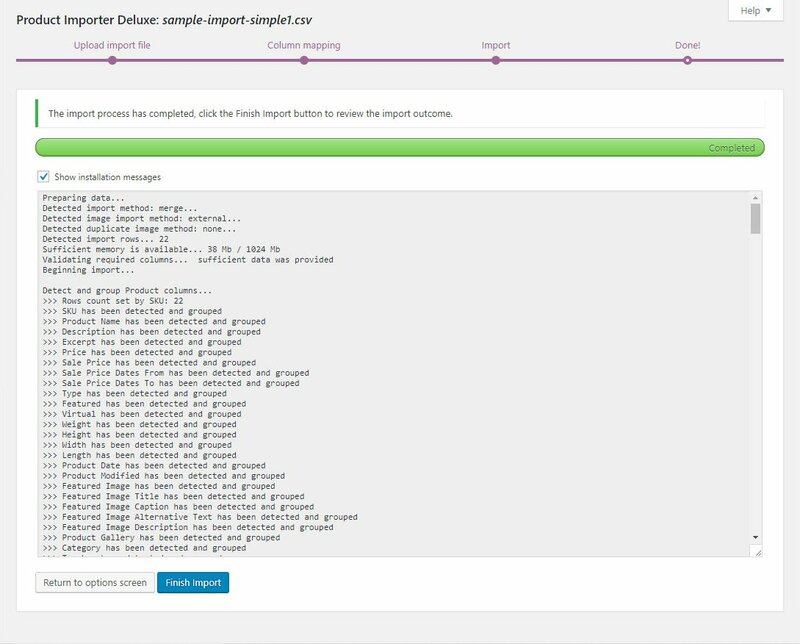 Work is being done to improve variation support for both importing and merging Product changes and expect a release this week for this. That sounds pretty solid. Looking forward to the updates. 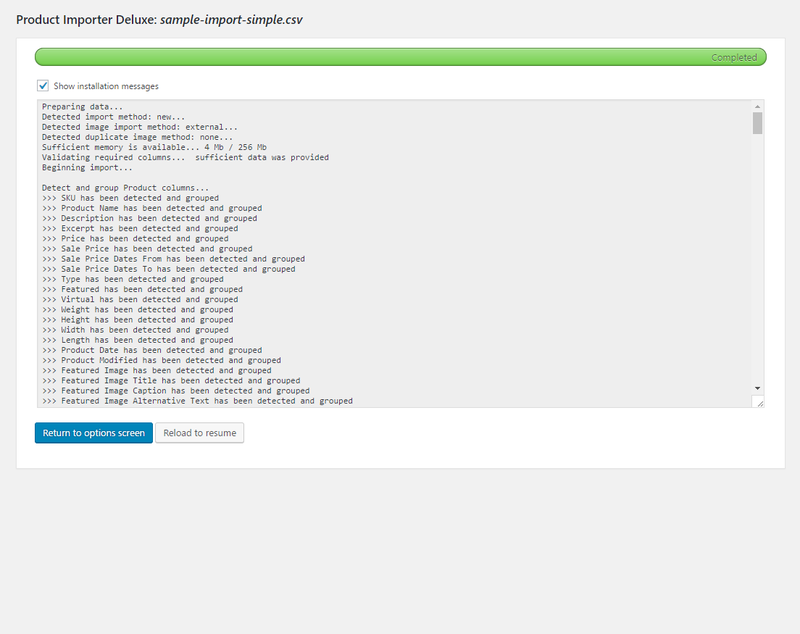 Hopefully, this plugin will import everything from the CSV properly and allow me to make updates on a regular basis. Thanks! I have found that going into the store toolkit and deleting the products will eliminate dupes. 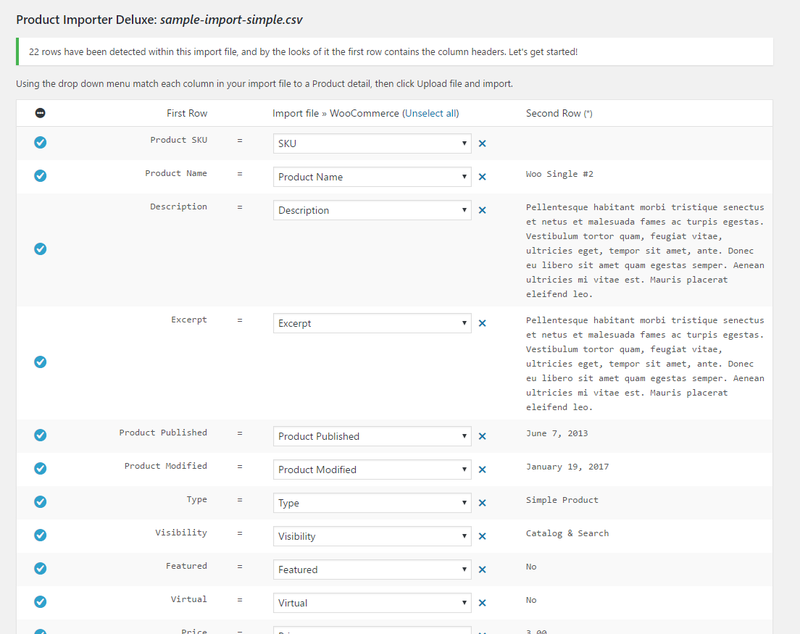 However, make sure you have an up-to-date CSV file to re-import your products. Out of over 300+ products I have only had 1 item dupe. 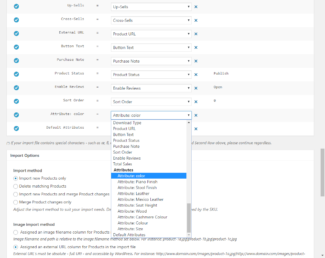 My issue is having to go back over every product and re-tick the boxes on all the product attributes to make them visible again and then re-order them because they sort in descending order of priority (opposite order of original CSV sheet). I have recently imported and merged many products merged. 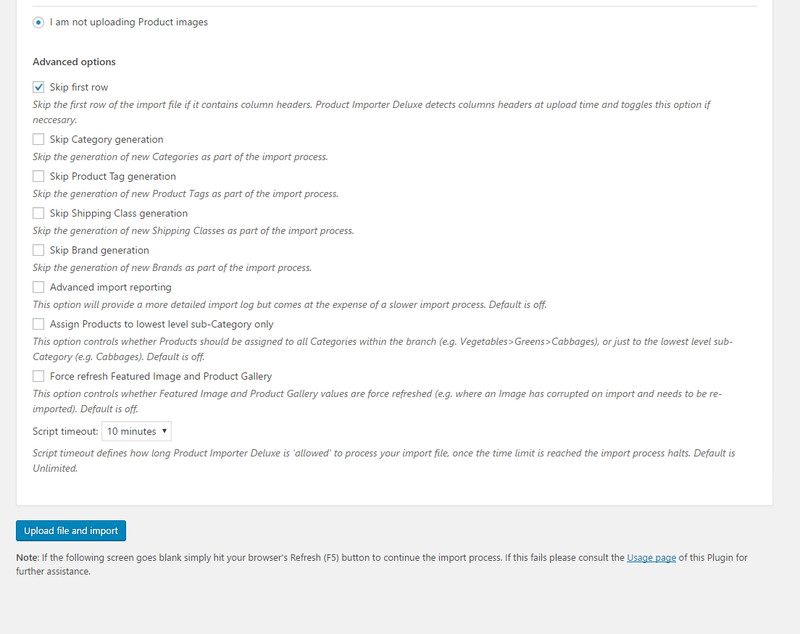 On initial import product image link does not re-attach to the image in that location. 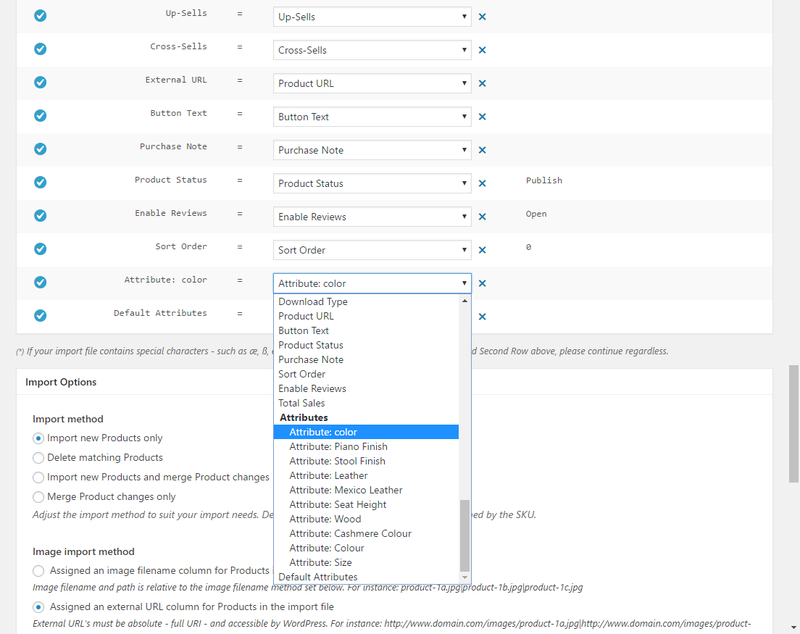 Also, Still have to re-tick attribute boxes on all products after merging. Many attributes (greyed out) are not available despite being on the CSV file and/or entered into Jigoshop in advance. 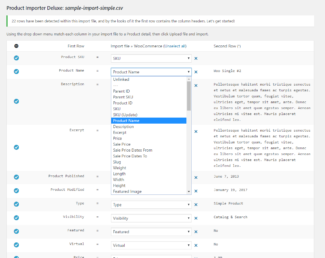 Product attributes still do not export to csv file. Question, I see on the example/template files provided up above there are attribute columns in the sample CSV files. 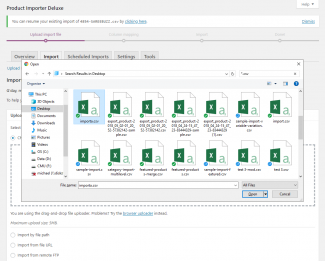 But, when I import my file with the size attribute populated in the CSV nothing happens. The product is listed as variable but there is nothing that carries over in terms of attributes or variations. Am I missing something or does this not work? Hi Susie, you’ll need to create the Attributes before importing them. 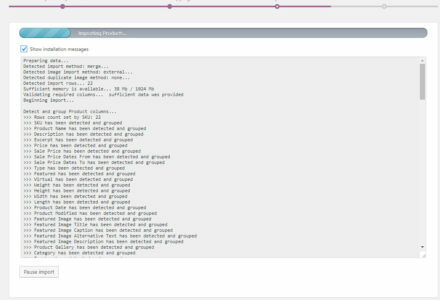 I’ve drafted a solution to generate the Attributes if they do not exist but it will require additional information (e.g. Type: text, select, multi-select, etc.). 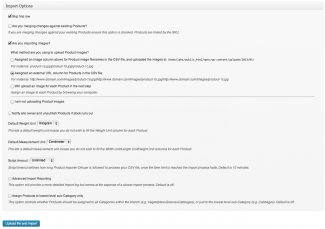 You can create new Attributes from Products > Attributes within the WordPress Administration. Is it possible to do the job automatically? I need to do this operation daily and of course it would be a timesaver to automate it somehow. Right now I do it manually but could you state how to write some code to make the calls with a wp cron? Hi danigosa, imports will need to be run manually from the WordPress Administration by an Administrator. In the future we hope to add support for wp_cron() but this will require substantial changes to the current importer. 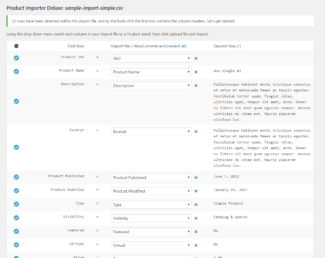 Is there a way to export products to a .csv file from my site? 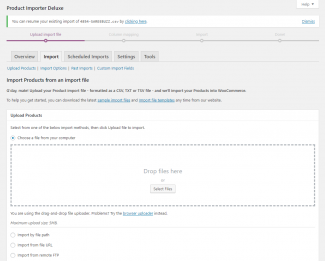 I currently use your importer with wp ecommerce. 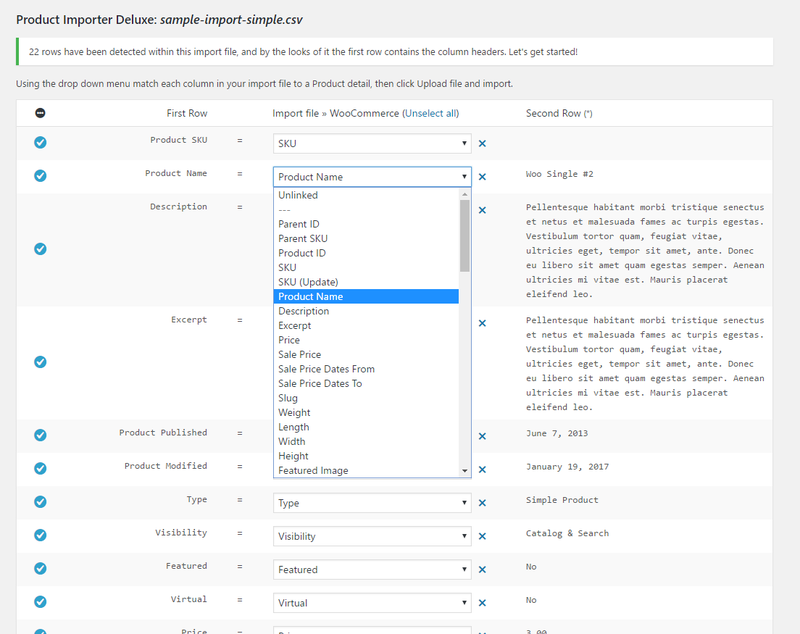 Hi Meghan, you can use my Exporter Plugin to export Products to a CSV file. Can this be used to import products into Jigshop, if I export from WPEC? There doesn’t seem to be a straight plug n play plugin for this yet?